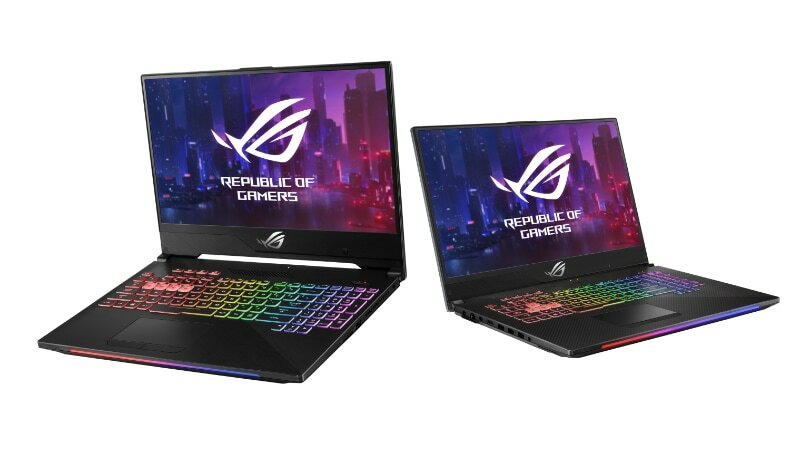 Asus at CES 2019 unveiled a range of gaming laptops from its Republic of Gamers (ROG) brand. The new range includes updated versions of the ROG Strix SCAR II and ROG Strix Hero II models with Nvidia GeForce RTX graphics. Both new ROG Strix models have hexa-core Intel Core i7-8750 processors along with 32GB of RAM. The Taiwanese giant has also brought the ROG Zephyrus S GX701, ROG G703, and ROG Zephyrus S GX531. There is also the ROG Mothership that brings a Surface Pro-like 2-in-1 form factor for gamers and enthusiasts. Among other new models, the Asus ROG Strix SCAR II and Strix Hero II come as an upgrade to the models that were unveiled at Computex 2018 and debuted in India last August. Both new ROG Strix gaming laptops have Nvidia GeForce RTX 2060 graphics over the previously available Nvidia GeForce GTX graphics. The Asus ROG Strix SCAR II comes in 15.6-inch and 17.3-inch display sizes that are available with 144Hz refresh rate and 3ms response time. Both variants of the ROG Strix SCAR II are draped in a “shooter-inspired notif” that has splashes of camouflage. There are also highlighted WASD keys to ease your FPS (first-person shooter) gaming experience. Moreover, gamers can choose to configure their ROG Strix SCAR II laptop with the GeForce RTX 2070. Unlike the ROG Strix SCAR II, the Asus ROG Strix Hero II is specifically designed for MOBAs (multiplayer online battle arenas) and is limited to GeForce RTX 2060 graphics. The machine has translucent keycaps to give an additional emphasise on the QWER row over the WASD cluster on the SCAR II. However, both ROG Strix II models have Nvidia Optimus technology to conserve power by only activating the discrete GPU when required. Asus has offered hexa-core Intel Core i7-8750 processors on the ROG Strix SCAR II and ROG Strix Hero II models with 32GB of RAM, SSD storage, as well as an optional SSHD upgrade. After the new ROG Strix II models, Asus unveiled the ROG Mothership that looks similar to the Surface Pro but boasts of enough power to support high-end games. The machine has an aluminium chassis with an ultra-fast, 144Hz/ 3ms G-Sync display powered by Intel Core i9 processor, coupled with Nvidia GeForce RTX graphics. The ROG Mothership also comes with a HyperDrive Extreme storage that has a RAID 0 array with three NVMe SSDs. The machine also has up to 64GB of DDR4 RAM. On the connectivity front, the new model has USB Type-C based Thunderbolt 3 port, standard USB Type-C port, four USB Type-A ports, HDMI, Ethernet, and an SD card slot. What makes the Asus ROG Mothership closer to the Surface Pro is its kickstand. However, the former has the ability to pop out the stepless kickstand automatically when the bottom edge of the chassis touches a surface to allow one-handed deployment. The hinge available on the machine is also touted to provide a range of angles for different setups, from standing straight to leaning back. Besides, there is an air cooling technology. The new gaming notebook portfolio by Asus also includes the ROG G703 that is powered by eighth-generation Intel Core processors with an optional Intel Core i9-8950HK processor. The laptop has a 17-inch IPS-level display with a 144Hz refresh rate and 3ms response time. It also comes with the HyperDrive Extreme storage, similar to the ROG Mothership. Asus also unveiled the ROG Zephyrus S GX531 that comes with a narrow-bezel, 15.6-inch display along with 144Hz refresh rate. The ROG Zephyrus S GX531 is powered by an Intel Core i7-8750H processor. Also unveiled at CES 2019 was the ROG Zephyrus S GX701 that sports a 17.3-inch display in a 15.7-inch wide body. This is claimed to give it an 81 percent screen-to-body ratio. The new ROG Zephyrus S GX701 is also claimed to be the thinnest 17-inch gaming notebook with 18.7mm of thickness. Asus hasn’t revealed the price details of the new ROG series models. Nevertheless, the new models with Nvidia GeForce RTX-series graphics are set to arrive in the global markets in the coming months.